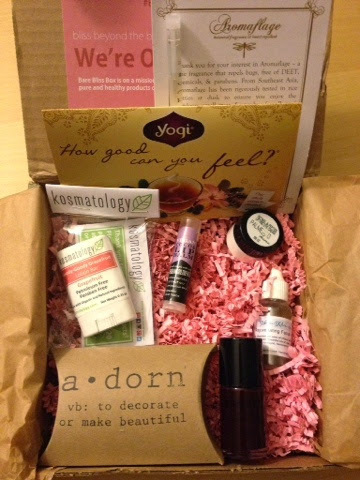 A new subscription box debuted in September, BareBlissBox, with a focus on natural and organic beauty products. (they also included a lifestyle product in there too!) 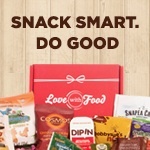 This is exactly what I have been looking for (I love trying new and green goodies!) 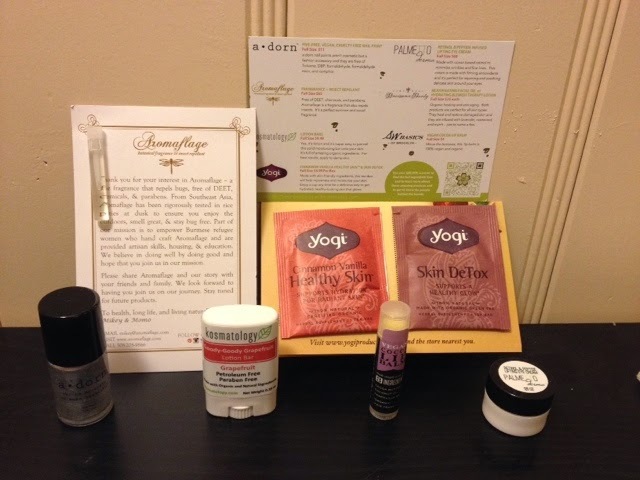 so I was psyched to receive a box from BareBlissBox to review. I have been enjoying this box for the past several weeks now and let me tell you, I can't WAIT for the next one.. I'm been loving each and every single product here! * A.dorn Nail polish - in Silver - this 5-free polish has just the right amount of sparkle! I saw other subscribers receive this in a dark red and a lime green. * Aromaflage fragrance sample (which doubles as an insect repellent!) This smells pretty good with its dual purpose. Will probably need to get the full size by next year's mosquito season..
* Kosmatology lotion bar- Scented in Grapefruit, this has got to be the CUTEST packaging ever! Reminds me of a small deodorant bottle, so I will have to figure out how to reuse this once I'm done with the lotion. The note card says it is best applied on damp skin, but I've found it to work just as well on dry skin. It's great for touch ups around the elbows, knees and even heels. * Palmetto derma Eye Cream- this retinol * peptide lifting cream contains firming antioxidants to help smooth and soothe your delicate skin around your eyes. Want to make it feel even cooling? Pop it in your fridge! Feels like you're wearing an eye mask but without anyone knowing! * SW Basics- Vegan cocoa lip balm (Not gonna lie- I was hoping it would be a toner or exfoliant as they published on their Instagram page.) This lip balm is amazing though.